Thank you for the texts, emails and comments in response to yesterday's post. Odie requires very little to make her happy and your words sure helped to do it! We have packed a bunch of action in the last two days. There is never a dull moment on the BoggsMobile. I ended the weekend post that I put up Tuesday with a picture of the tacos Kelly Jo made for supper Monday. I looked at those a moment ago and they flung another craving on me. That girl can make some seriously killer tacos! What I did not mention Tuesday morning was that we were having electrical problems. As we were going to bed, we noticed one side of the electric was acting crazy. I did not know if it was the bus or the power from the church. It was raining and I got soaked trying to sort it out. I finally turned the generator on and everything evened out. I went to bed. It rained cats and dogs most of Tuesday so I let the electrical situation simmer on my brain and the collective bus brain around the country. While that was going on, we still had to eat. We met Pastor Dennis King, Sis. Judy King, Nathan and Quinton for lunch at Nue Ranch in Gainesville. We really like their little lunch buffet and it did not disappoint. We had a wonderful time visiting with our dear friends too. When the rain quit about 5:00 PM Tuesday I investigated the electrical problem. The breaker inside the church was fine. Outside one side of the 50 amp receptacle was a solid 120 volts. The other side went from 120 volts to 0 volts to 40 volts to 120 volts to 60 volts to 120 volts. I thought the wire might be loose. I removed the 50 amp receptacle and it literally fell apart in my hands! 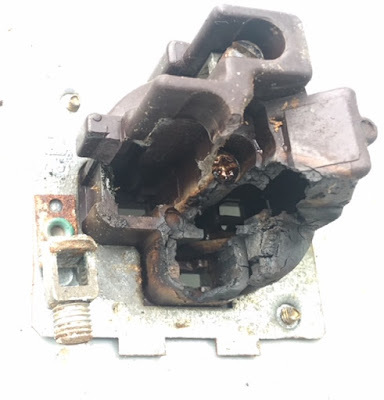 Evidently one of the connections had worked loose over the years and a loose electrical connection gets hot. This one had been very hot! After supper we went to Home Depot to fetch the parts and this is what we ended up with. We had plans Tuesday evening to meet our niece Deidre and her husband Ben for supper at Chili's in Gainesville. They are working in a church in Sherman about 40 miles away. We loved getting to see them and to spend some time with them. It was nice of them to make the drive over. We love you both! Wednesday we cranked the BoggsMobile and continued our journey northward toward OKC. We made a stop before we left Gainesville at the Quick Trip truck stop. I was no where near empty, but diesel was going up 35 cents a gallon in Oklahoma. Might as well save nearly $40. We stopped our journey in Pauls Valley, Oklahoma to eat lunch and visit with dear friends, Larry and Rose Landress, Bruce and Priscilla Mayhan, Jeffery and Rebecca Blankenship and their sweet girls. It was nice that all of them put their busy lives on hold to meet us for a while. We love each and every one of you. Later we made a last minute decision to go to revival with Bruce and Priscilla at their home church in Pauls Valley. We had a good time and saw a lot of folks we have not seen in a long time. It was a great ending to a great day. This morning we will finish the drive to Oklahoma City and begin Fellowship Meeting tonight at Mt. Vernon Holiness Church. We are looking forward to the whole weekend! Thank you for joining us for the ride today.